simply call us and we can set up a time. 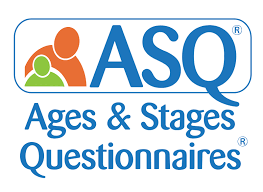 The ASQ screeners are sets of valid, reliable, and age-appropriate questionnaires that are filled out by the true expert on your child—you! There are two screeners in the ASQ family: ASQ®-3, which looks at key areas of early development, and ASQ®:SE-2, which focuses on social-emotional development. Tell me more about ASQ-3. Communication: Your child’s language skills, both what your child understands and what he or she can say. Gross Motor: How your child uses their arms and legs and other large muscles for sitting, crawling, walking, running, and other activities. Fine Motor: Your child’s hand and finger movement and coordination. Problem Solving: How your child plays with toys and solves problems. Personal-Social: Your child’s self-help skills and interactions with others. The “Overall” section asks you open-ended questions about your child’s development and lets you weigh in with any concerns you may have. How long does an ASQ questionnaire take? You’ll only need 10–15 minutes to fill out an ASQ-3 or ASQ:SE-2 questionnaire. It’s that quick and easy! You’ll receive an ASQ questionnaire from PFN. You may receive it in the mail, be given access to a secure website where you can fill it out, or be given the questionnaire during an in-person visit. You’ll answer each question based on what your child is able to do now. Your answers help show your child’s strengths and areas where they may need practice or support. After you complete the ASQ questionnaire, just return it to Plymouth Family Network. They’ll score the questionnaire, share the results with you, and discuss any follow-up steps.